Fiji Airways, voted Best Airline in the South Pacific as awarded by Global Traveler, has announced plans to commence seasonal twice-weekly direct services from San Francisco to Nadi, Fiji this summer and next December starting June 16th, 2016. 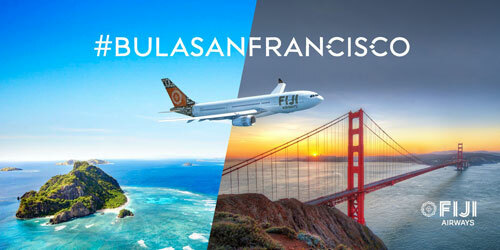 The flights will operate from San Francisco International Airport (SFO) to Fiji (NAN) on Thursdays and Sundays, with flight times to provide easy connectivity within Fiji, to Australia, New Zealand, and the South Pacific Island nations. Flights will be available for purchase on www.fijiairways.com. The new services will allow more Americans to visit Fiji and experience the natural beauty of its islands and the world-renowned hospitality of the Fijian people. The flights will also make it convenient for the Fijian, Samoan and Tongan communities living in San Francisco, to take trips back to their homeland to see family and friends. The San Francisco-Nadi flight will depart at 11pm (local time) Thursdays and Sundays, arriving in Nadi at 5am (local time, +2 days). The flight will depart Nadi on Thursdays and Sundays at 9pm (local time), arriving in San Francisco 12:30pm (local time, the same day). Operated using Fiji Airways’ A330 aircraft, 10-hour direct flight offers both Economy and Business Class travel options. All Fiji Airways flights are full-service, and include checked baggage, in-flight entertainment, meals and alcoholic beverages. About Fiji Airways: Founded in 1951, Fiji Airways Group comprises of Fiji Airways, Fiji’s National Airline and its subsidiaries: Fiji Link, its domestic and regional carrier, Pacific Call Comm Ltd, and a 38.75% stake in the Sofitel Fiji Resort & Spa on Denarau Island, Nadi. Fiji Airways aims to be the leading global boutique airline, and has a fleet of brand new wide body A330s and refreshed B737 aircrafts. Fiji Link has a fleet of ATR 72, ATR42 and DHC-6 Twin Otter aircraft. From its hub at Nadi International Airport, Fiji Airways and Fiji Link serve 49 destinations in 13 countries (including code-share). Destinations include Australia, New Zealand, USA, Hong Kong, Singapore, Samoa, Tonga, Tuvalu, Kiribati, Vanuatu and Solomon Islands. The Fiji Airways Group brings in 64 percent of all visitors who fly to Fiji, employs over 1000 employees, earn revenues of over FJD$769 million ($372m USD$), and directly contribute a significant portion of the country’s Gross Domestic Product (GDP). Fiji Airways rebranded from Air Pacific in June 2013. Visit www.fijiairways.com for more information.